IEEE 802.15.4 is a standardized wireless protocol used in products such as the Nest thermostat, Philips Hue lighting, Kwikset Smart deadbolt locks, and most smart meters in public power grids. The protocol has been around for a while now and has been integrated into many products, especially for home automation and smart grid applications. This makes it a good target for wireless packet capture and traffic analysis. 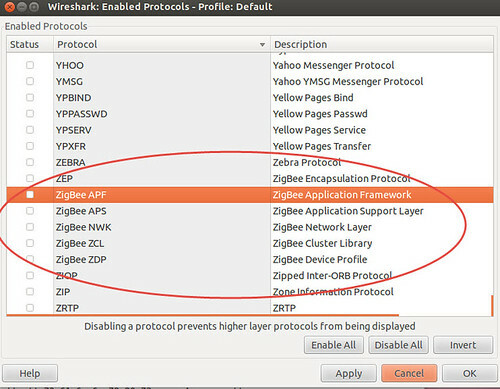 To capture packets, Wireshark needs a capture device that feeds it data in a specified format. Many years ago, I wrote a blog post on how to use a Freakduino as a wireshark capture device using a software bridge to collect the raw data and feed it into Wireshark. 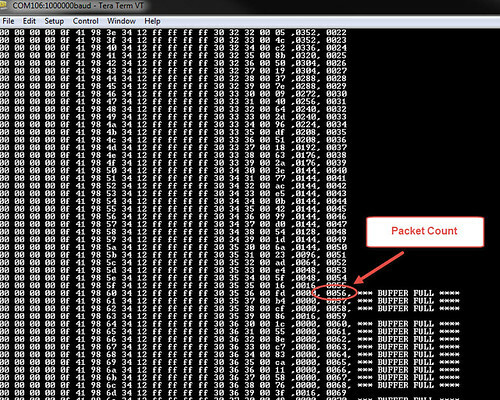 Since then, one of the main applications the Freakduinos were used for was an 802.15.4 packet sniffer. I've also had to field many questions on setting up the Freakduino as a capture device for Wireshark so I decided to put together a video on it. I also put together a writeup of the tutorial below the video for those that just want to skim the text. 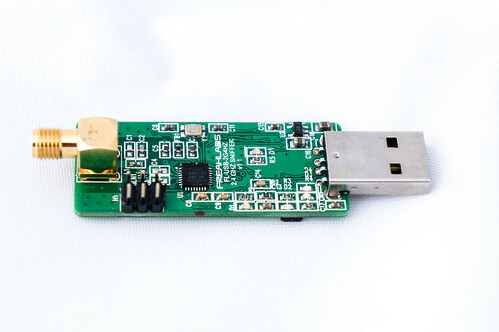 One of the main reasons I created the FreakUSB series of devices was so they could be used as a packet sniffer. They're compact, simple, and optimized for interfacing to a PC. 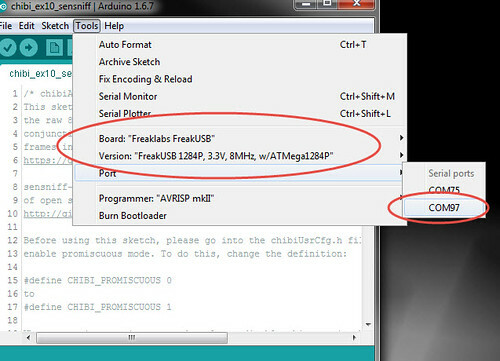 There are two MCU variations of the FreakUSB devices, one with an ATMega328P and one with an ATMega1284P. The ATMega328P is the standard MCU that is used in Arduino applications. It's a general purpose MCU that is also low cost which means that it doesn't have much in terms of resources or more specifically, RAM. RAM is important in packet capture type applications since the size of the receive buffer determines how much traffic you can handle. The MCU needs RAM to buffer packets that come in since it takes time to process them and dump them to the serial interface. Under heavy traffic loads, the amount of packets coming in is usually greater than going out which means that your ability to weather the load is dependent on how many packets you can buffer until the packet storm ends and you can output the data. The more RAM you have, the more packets you can buffer. I put together a simple stress test to emulate outputting wireless received data to the serial port in high traffic conditions. This is to demonstrate the effect that buffer size has on wireless capture device performance. 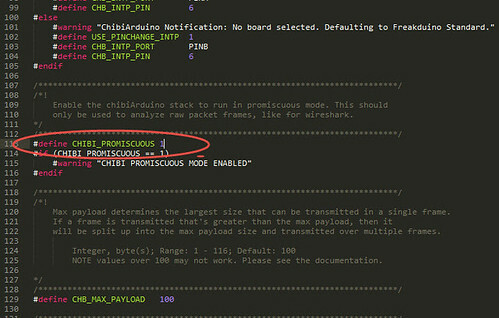 The following code needs to be run with the chibiArduino wireless stack, v1.06 or above. usage under high traffic conditions. // out the serial port as quickly as possible. On windows, 250kbps can be used. // to boost the speed on a Windows system, use 250000 rather than 115200. In this test, the receive device is set to promiscuous mode. In the chibiArduino library, a standard ATMega328P based device is set to the default 768 bytes of receive buffer. That's near the maximum amount you can safely allocate since the device has 2 kB of RAM and you need approximately 500 bytes for the chibiArduino stack and 500 bytes for the Arduino subsystem. For the ATMega1284P, it has 16 kB of RAM so the chibiArduino stack will set the receive buffer at 10 kB, a 10x increase. Here is the packet capture dump for the ATMega328P based FreakUSB based device. You can clearly see the packet count at which the buffer indicates its full. After this point, it will start dropping packets if it receives frames that it can't fit inside the buffer. For the FreakUSB 1284P, it was able to handle 1000 packets back to back but with an initial receive buffer size of 10 kB, it went all the way down to about 2.5 kB of free space in the buffer before the packet storm let up. Once the free space in the receive buffer goes to zero, then there is a chance that packets will be dropped. The stress test is not very realistic in terms of emulating actual traffic but it does provide an indication of performance. RAM, MCU speed, and hardware acceleration like DMA would also affect the performance numbers. In summary, for packet capture devices, it really depends on what level of performance you need. 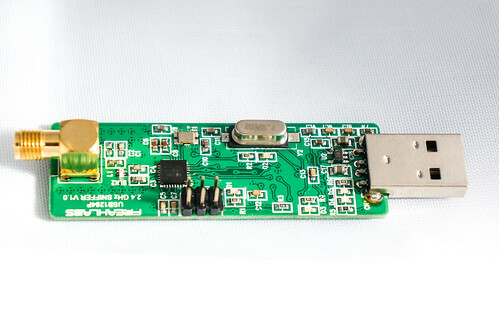 For general purpose sniffing in light traffic, I'd recommend the FreakUSB standard while if you have RAM heavy applications or will be capturing in heavy traffic, I'd recommend the FreakUSB 1284P. 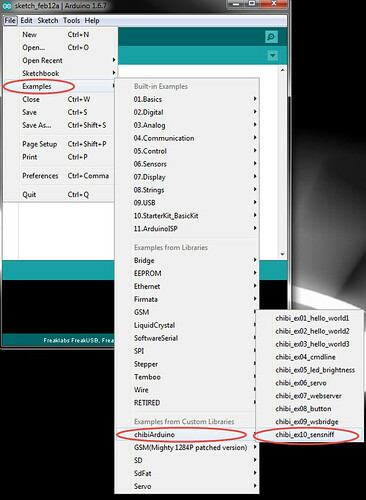 To set up the FreakUSB boards, you need to open the Arduino IDE. 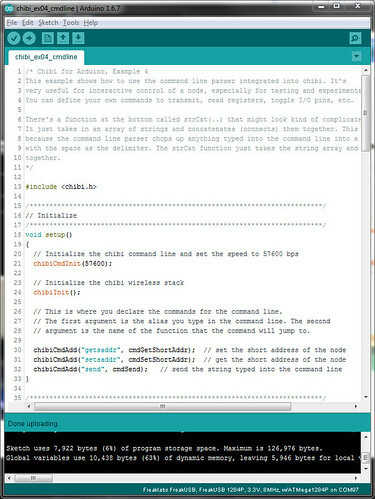 In this case, I'm using the Arduino IDE v1.6.7 downloaded from www.arduino.cc. 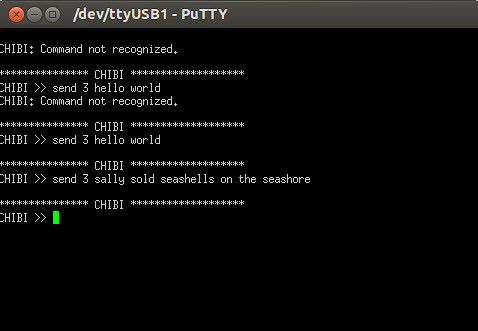 You also need to have the chibiArduino library installed (v1.06 or higher) as well as the hardware board support files. If you haven't done this yet, please check the FreakUSB user manuals on how to install these. Next, configure the board by going into Tools/Board and selecting the corresponding board and model you'll be uploading the code into. Then select the corresponding serial port that board is using. Once this is all configured, you can simply click on the upload icon to compile and upload the code to the device. Once this is all done, don't forget to set CHIBI_PROMISCUOUS back to 0 for normal operation. We'll also be setting up another device that can be used as traffic generator for sniffing data. In this case, I'm using another FreakUSB dongle and loading the chibi_ex04_cmdline sketch into it. To do this, you follow the same sequence of steps but don't set the device to promiscuous mode. Now we're going to set up the Sensniff software. You can pick it up from the original source here, but I'd recommend picking up the sensniff-freaklabs fork of the software. You can find it at the freaklabs github account here or can just download the zip file here. 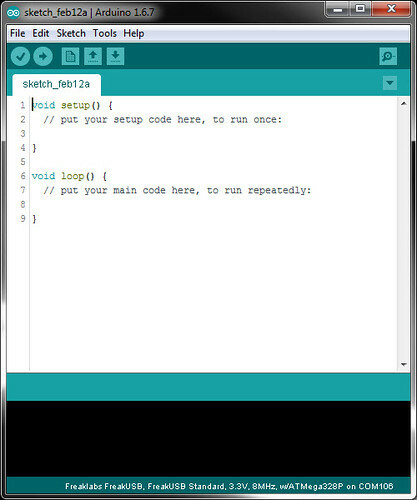 Sensniff-freaklabs is just the sensniff software but with the defaults already modified to match the example code. It saves you a few steps but either version should work. You can change channels by typing in the channel number you want to change to. Otherwise, you can also print the current channel . If you dig into the software, you can also add specific commands that you might want to control from the interactive shell. Sensniff is a wonderful piece of open source software written in python by George Oikonomou who maintains the Contiki open source project and is a lecturer in IoT at the University of Bristol. Sensniff acts as a bridge between a packet capture device and wireshark and is used by the Contiki project as well as Texas Instruments to capture data for IEEE 802.15.4 traffic. It not only captures data in real time, but can also capture data and store it as a pcap file for offline browsing. This comes in handy to just leave the sniffer on for a few days when intermittent network bugs appear. 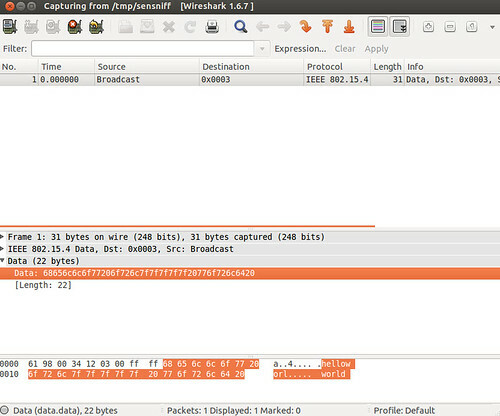 Then, the packets can be filtered and analyzed in wireshark offline. Sensniff also supports a bunch of other features and is exensible with an interactive command interface. It's quite a nice tool to use in conjunction with the FreakUSB boards. This assumes you are using the default pipe name and path in sensniff. Once wireshark is open, it will listen on the named pipe (/tmp/sensniff) for data that comes in. Any data that comes in via the hardware packet capture device will get sent over serial to sensniff which then formats the packet. It then sends the formatted data into the named pipe to wireshark. 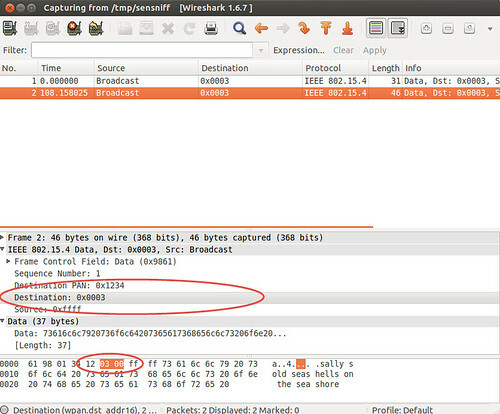 Once wireshark sees the data, it will display it in the capture window. That will send the text string "hello world" to a destination node address of 3. There is no node 3 at the moment, but that's not important. The main thing is to capture the data and view it on wireshark. 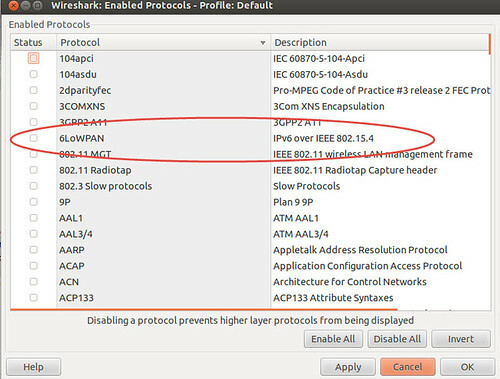 Once it's captured, wireshark will decode the data as 802.15.4 data. Then we can click in the various packet fields and wireshark will highlight which field it is as well as bring up the decoded name. Here's another example where I send a text string to wireshark. Then I click on the destination address field and it will automatically highlight the bytes in the packet where the destination address is. 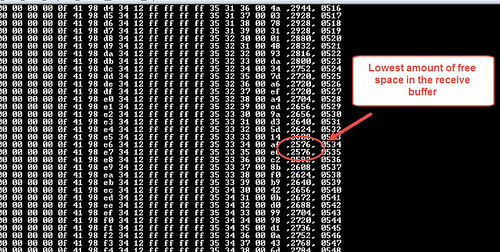 You can not only decode the raw 802.15.4 packets but any protocol that sits on top of it. So if you have a Zigbee or 6LoWPAN device, you can also decode those packets as well. 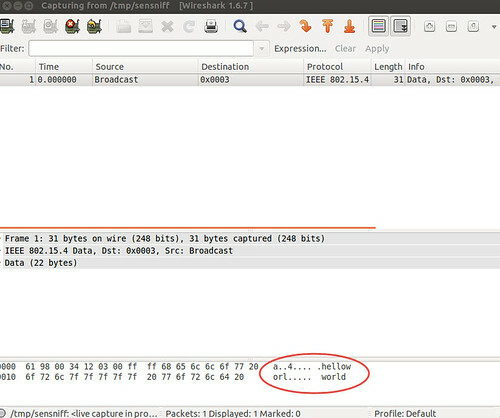 Once the data is captured into the pcap file, you can then have wireshark open it to read and decode the packet capture with the following command. I hope you enjoyed this tutorial about how to sniff wireless sensor data using Wireshark, Sensniff, and FreakLabs. The combination creates an amazingly powerful tool for troubleshooting network issues, hardware issues, or IoT security. If you liked this article, please support me by buying my products. All the hardware in this tutorial can be found at my webshop at http://www.freaklabsstore.com. Thanks! Thanks for the great tutorial. Can we use Freakduino to do the sniffing? I already own a couple of Freakduino and was wondering whether I can use it or I should buy the new FreakUSB to do this. Are there any major difference between 900 MHz and 2.4 GHz versions apart from the frequency in which they operate? Would love an article from you that talks about the difference between them and a guide to choose one over the other. 900 MHz is generally preferable because it has longer range, passes through obstacles better, and is less crowded. 2.4 GHz is a global license free band though so more products are using it. That makes it more desirable from a compatibility point of view. Unfortunately, WiFi is a major traffic source in this band so you have to be careful where you position 2.4 GHz devices to make sure they can coexist with it. Thanks for the tip on the article. I'll look into putting something together.